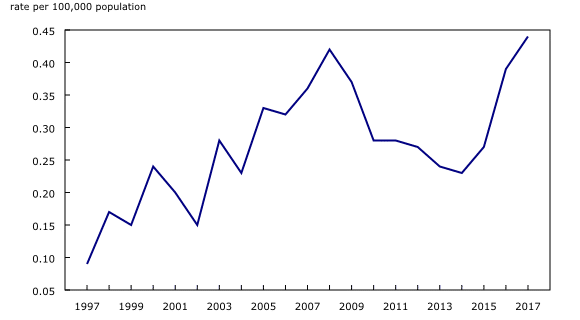 TheGunBlog.ca — Fatal gang shootings rose in Canada for a third straight year in 2017, Statistics Canada said today. They almost doubled as a share of total homicides since 2015, the year the Liberal Party was elected to government. The government of Prime Minister Justin Trudeau promised a year ago to channel more tax revenue to police to fight the swelling wave of attacks by more than 430 active gangs in cities and rural areas. None of it had been shared as of June 1, Trudeau’s crime minister said in a filing to parliament on June 4 and published on Twitter this week by a policy advisor to the opposition party leader. The failure of the federal, provincial and local governments to keep residents safe has led many to rely on their firearms for protection, even though the law doesn’t allow buying guns for personal defence. The 266 shooting homicides last year out of 660 total homicides represent less than 0.08 percent of police-reported violent crime in Canada, according to calculations by TheGunBlog.ca. All homicide was less than 0.2 percent, StatCan said. 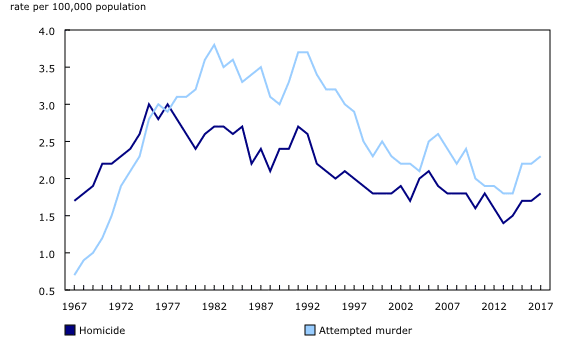 The homicide rate has been declining since the 1970s and remains near a 2013 low. Total firearm-related offences, including those related to paperwork or storage, represent “less than one half of one percent” of all crimes, StatCan said in March. Even after a 49 percent jump in shooting homicides in the past two years, the 3,371 killings by stabbing this millennium exceed the 3,292 deaths by bullet, according to calculations by TheGunBlog.ca based on StatCan data. Firearm users in Canada fall into two broad groups with almost zero overlap. The first group is the safe and responsible users who are authorized or required to use guns for personal and public safety, hunting, recreation and competition. It includes more than 2 million civilians approved by the federal police to own guns, millions of unlicensed family and friends who shoot under their supervision, and some 180,000 military, police and law-enforcement officers. The second group is an unknown number of unauthorized individuals who obtain or use their guns illegally. They use their weapons for self-protection, or with the intent to threaten, hurt or kill others. 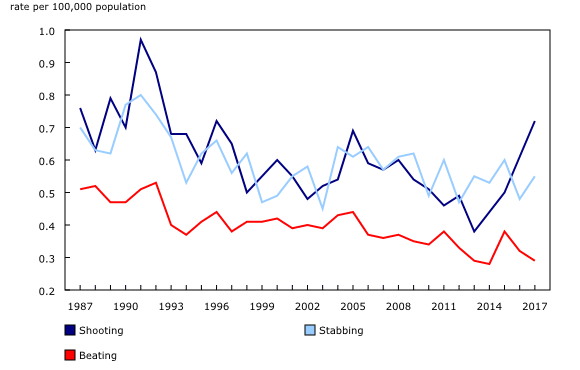 Trudeau is using the rising gang murder since he took office as a pretext to impose gun bans and other restrictions on hunters and sport shooters in the lawful group. All guns are banned already for everyone under threat of prison unless they obtain temporary waivers from the federal police. The second group doesn’t request or obtain the authorizations. Toronto alone had 58 homicides by bullet in 2017, more than any other city and representing 21 percent of the total firearm-related homicides. This year marks a record number of homicides in Canada’s largest city, led by an attacker who killed 10 people with a van. The mayor is driving a national campaign to eliminate many hunters and sport shooters from Canada. 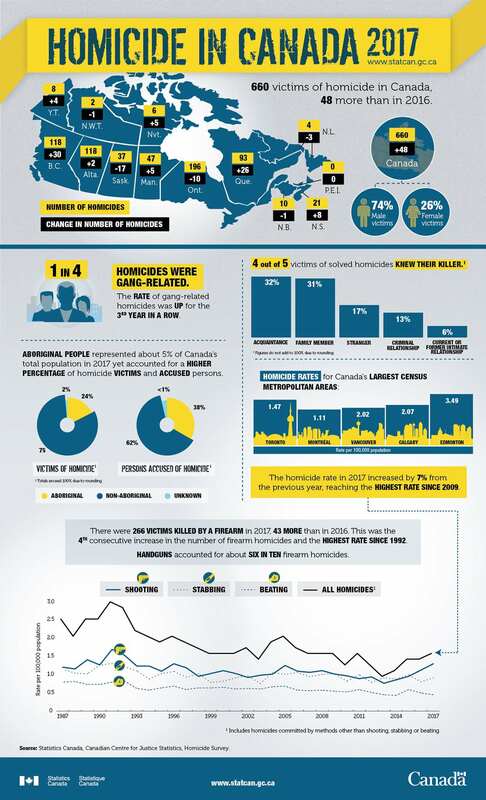 Source: Homicide in Canada, 2017 (21 November 2018). Infographic. Nov. 2016: Stabbing Is Top Method of Homicide, So Why Such a Focus on Guns?